08:10:40,590 ERROR [org.jboss.as.controller.management-operation] (ServerService Thread Pool -- 55) WFLYCTL0013: Operation ("add") failed - address: ([("subsystem" => "teiid")]) - failure description: "TEIID50069 Failed to load module com.rakutenmarketing.brokerproxy"
What have I missed? Thank you in advance. hmm, everything else seems to be in order, not sure why it is failing to load. I double checked the names you provided. If you want to run in TRACE in need to expose "org.jboss.as" category. If there is a way to debug I would also try that. If those do not reveal then you can attach code here, maybe I can run locally. move your module from "teiid9.1.1./modules/system/layers/base/..." into ""teiid9.1.1./modules/system/layers/dv/..."
then it will load fine. Odd. That still does not work for me. I tried the same setup with a custom meta parser as a test of my setup and the stack trace indicates the module isn't found still. Looking through the trace I see a few module not found entries on core packages. I may have a corrupt server but it works for everything else so I'll try a fresh unmodified server in the morning. Thank you for looking at this today. Trace shows nothing so far except the fact that it can't load the module. 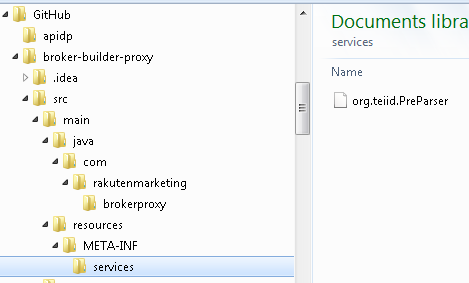 There are no permissions on any directories. Anyone see what I may have missed? I've moved to Teiid Embedded as it was a good future state for our work. The preparser works well there. Thanks for all the assistance! Excellent. I'll try it again this weekend. I rebuilt from the archetype at GitHub - teiid/teiid-tools: This project contains tools to help with Teiid development tasks and it works that way but still did not work for me otherwise. I'll have to come back to this task but can point out the maven archetype as a good workaround for anyone else. Best indication is that the cli script with the explicit depends correctly registered the teiid-api and other dependencies.